We’re only eight days away from witnessing the most bitter feud in light heavyweight history when former champs Quinton “Rampage” Jackson and Rashad Evans settle their differences at UFC 114. 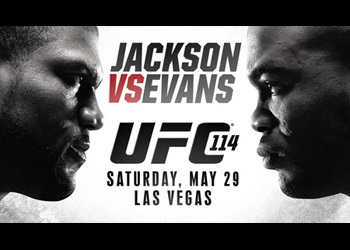 In case you can’t get enough of the pre-fight hype, the world’s premier MMA organization has just released the extended trailer for UFC 114 to entice your taste buds even further. Rampage holds an impressive 30-7 professional record, however hasn’t fought since taking an uneventful unanimous decision over Keith Jardine, Evans’ Jackson Submission Fighting teammate, at UFC 96 in March 2009. Evans bounced back from his only professional loss when he escaped with a unanimous decision victory over Thiago Silva at UFC 108. Although the wrestler dominated much of the matchup, Evans was nearly knocked out in the fight’s closing seconds by a desperate Silva. The May 29th event takes place inside the MGM Grand Garden Arena in Las Vegas, Nevada.